Over the weekend we were able to get in the garden and plant some seeds, and I can't tell you how good it felt! Spring is such a thrilling time of year, and the beginning of the gardening season is full of hope and promise. For many months now, I've been waiting rather impatiently to plant the Red Russian kale seeds that my blogging buddy, Sue, sent me last year! I'm so excited to see how they do and try this variety of kale. I'm excited about the radishes as well, because I think the sprouts are just about as delicious as the actual radishes themselves (here is my favorite way to use the sprouts). We have done a ton of work on our garden in the last year, with adding a lot of garden beds and fencing in the area to keep the critters out. We are adapting it as we go and see what works and what doesn't work from year to year. I took this photo to show how bare it looks now, because I can't wait to take another photo in a few months and compare the before and after! We tried to stay as frugal as possible when creating the garden beds and fence, so a lot of the wood is reused from other projects or from materials given to us by family (like the green beds you see up front). So it has a little bit of a hodge-podge look to it now - let's call it rustic haha - but when everything starts growing and blooming it will really fill in and look awesome. I can't wait! PS - Congrats to Jennifer Wood on winning the seed starting giveaway! We will have another seed starting giveaway coming up in the next month or two, so be sure to check back for another chance to win. Glad you have been able to get out and enjoy gardening! I agree, it's a wonderful time of the year. Your garden beds look neat and tidy. you have a really nice garden site! Very nice - it looks as though you did so much work preparing your garden beds! It must be exciting to get out and start planting - I can't wait to see all your fresh veggies in a few months! Oh, I admire so much that you are already turning your soil & planting seeds!! We have far more than our standard 6 ft. of frost in the ground this year. Most people here don't plant until late May / Memorial weekend. I'm hoping to get some early cool weather things in this year though. Your garden set-up looks great! And your dirt looks really rich. And you said you wondered if the winter would ever end, and now you're planting seeds. I hope there isn't another weird snowstorm after all the planting you're doing. I used to start seed indoors mostly in trays in the windows. I can't wait to see it in a few months! It looks great to me!! Yahoo for spring! Can't wait to see your photos in a couple of months when everything is green and growing. I am looking forward to the before and after photos now, too!! How wonderful that you were able to get out and begin planting, and I can't wait until the 'after' photos! We have at least a month and a half before we can plant anything outside but that's okay, we'll get there! How fun to be out in the garden. Best wishes with the kale seeds from Sue. Thanks for the link to your radish sprout/mushroom salad...John and I will love that. You both are very smart to use what you had on hand in the garden. I look forward to the "after" photos. How exciting! I can't wait to start our garden! I need a fence to keep my critters out too (aka - two children who love to stomp in the mud). I love gardening with them though... but it works out best when I'm right there, with them. Spring is indeed in the air. Can't wait to see how your garden fills in! Such a big, beautiful space! I completely agree about the radish sprouts. Yummy!! Oh Tammy, your garden is going to be wonderful, glad you guys are back at it. I really do love the look of your garden, and am anxious to see how it fills in. I had to show Cliff your pictures and how you are starting out. We aren't up for revamping our garden this year, but definitely going to have him follow along on your garden this year to help us plan for 2015! How exciting.. I do Love this time of year as well. Even though there is no gardening in my future.. One of the downfalls of living life in an RV.. I cant wait to watch your garden grow.. Keep the photos coming. you are an early bird to have already started your garden. It's terrific and I can't wait to see it flourishing in a few months. I must get started on mine. Thanks for the inspiration. You will have so much fun planting in your wonderful garden space!! I look forward to watching the transformation! I am jealous, jealous, jealous of that fantastic fence! I think David is being summoned to Maine to recreate one here! As you said it will be very happy to plant a seed and also too happy to see them grow. You have a lot of space to grow lot of plants. Good luck! I love your fence! It looks much better than ours. 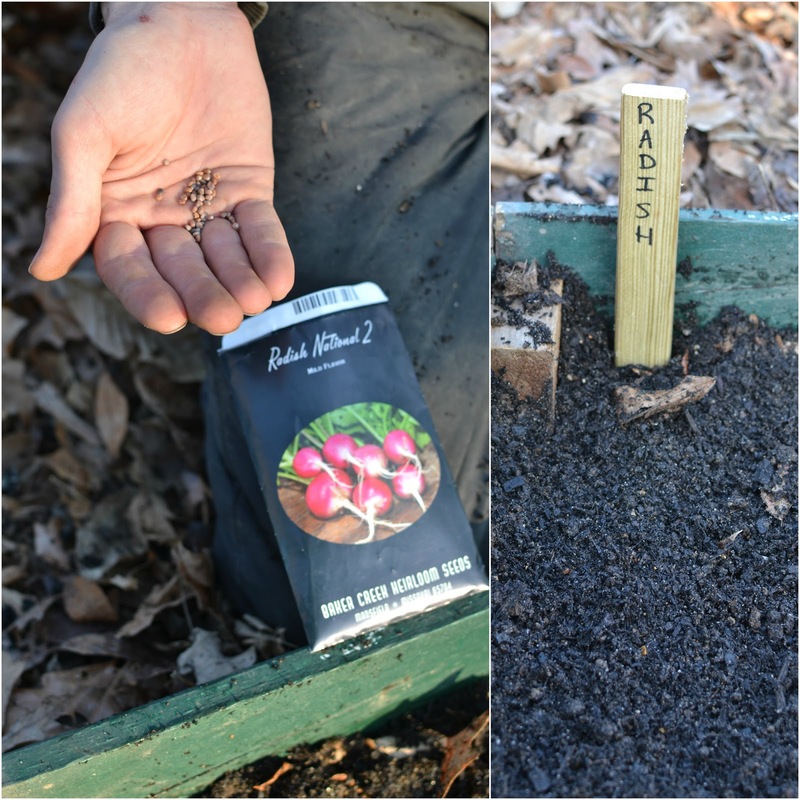 I don't care for radishes, but I'm going to try planting them this year, because a reader emailed recently to tell me to try planting them in between squashes. She said that they repel squash bugs, and we've had a terrible time with squash bugs. What a wonderful garden you've got going!! Is the fencing to keep the wild rabbits out and future goats?? I would think that you want the chicken in with you to eat all the bugs everywhere!! Your garden space is beautiful! Since mine is still under two feet of snow it is great to see that you are able to get out and plant some seeds. I haven't even started my seeds indoors yet, since I can't plant outside until last week of May (at least generally, that is a safe time!). This weekend I am going to get my hands dirty and get some seed started. I can hardly wait!!! I'm jealous! I have been itching to get out into the gardens, but it is too cold and the ground is still frozen. It was 60 on Sunday and 20 today! I've been dreaming about putting in the new cut flower garden and medicinal herb garden I planned for this year, but have yet to start due to the weather. Hopefully this weekend I can find the time to get some seeds started. Your garden looks very nice, I love the "hodge-podge" look and I am sure it will look awesome when everything is growing. Oh man, my kind of garden. I have just started a love affair with radishes so very please to see these go in. I have been using seeds from Baker Creek Heirloom Seeds for three years now. I love the packaging and the seeds have done so well for us. I also love looking at their catalog. It is so fun. PS that garden area looks great and I can't wait to see the transformation either! Enjoy the start of the gardening season! Such beautiful seeds - can't wait to see what your garden produces my friend! We are thinking Spring here too, can't wait!!! Good luck with your gardening. I don't have a garden, just a patio. That's a massive garden! I can't wait to see it in a few months, I'm sure it will be amazing. Looks like a wonderful garden area.. And it is great you found a way to keep the critters out. Have a happy day and weekend! That garden plot looks ready for those seeds , well done. Great space, I love the fencing. I'm looking forward to the before and after, too. How exciting you were able to get in the garden. I have a lot of clay even after years of adding compost and amendment. So right now I have a bog. I planted Russian Kale the last couple of years. We don't really eat it so I give a lot of it away. We also get aphids on it. Last year wasn't a bad aphid year but stillbhad some. cheap tiffany uk sale Meanwhile, tiffany jewellery uk sale under the infuriating pushed, cheap body of impurities is discharged through the pores of the body. At the same time there is an infuriating return to the cheap tiffany uk sale sea air, actually shrink himself cheap tiffany uk sale into a little yellow ball, then the ball disaggregated into two, then at breakneck speed toward a cheap tiffany uk sale cheap eyes. Feel the eyes burning, cheap opened his eyes, two beams of yellow light speed tiffany london sale cheap tiffany uk sale injection, cheap eyes went, burning weeds, rocks crack.